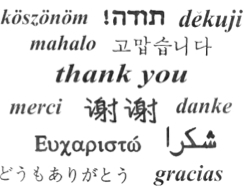 We heard from all over the world and are now happy to announce that our December 2011 goal of $50,000 has been met and exceeded! Thanks to all of you who gave so generously. May your New Year be blessed! John Maddex visits the home of Fr. Peter and Kh. 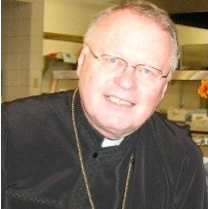 Marilyn Gillquist to talk about the recent announcement by His Eminence Metropolitan Philip of Fr. Peter's retirement as Chairman of the Dept. of Missions and Evangelism for the Antiochian Archdiocese. Joining them is their son, Fr. Peter Jon Gillquist. In this prophetic Psalm, we have a song filled with love and a Psalm which gave theme to Hebrews 10. See the incarnation of Christ in this beautiful hymn of the Church. 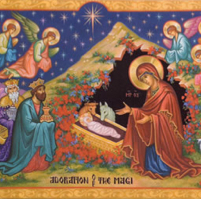 The Incarnation - Do We Really Believe It? Fr. Thomas Hopko presses the question that should be foremost on our minds during this Nativity season. What do we really believe about the incarnation of Christ? Fr. 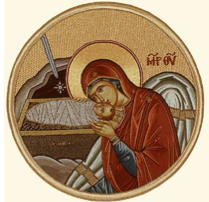 Lawrence Farley reflects briefly on the significance of the incarnation. Up until that time, God dealt with humanity from the outside looking in. Now he comes in the flesh and dwells among us. 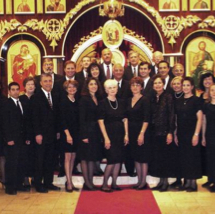 Fr Joseph Huneycutt welcomes you to St Joseph Orthodox Church, Houston, Texas for this Special AFR Christmas presentation: “God is With Us” by the St Romanos Chorale under the direction of Dr William Attra. In the current episode of Worship in Spirit and Truth, Fr. 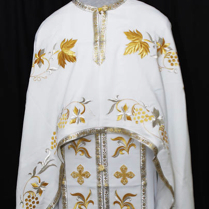 Thomas Hopko explains the basic vestments worn by the priests and bishops for the Divine Liturgy. Does color matter? Listen below and find out. This is part 1. "Ancient Faith Presents" an interview with Cheryl A. Tuggle, the author of the new novel from Anaphora Press titled Unexpected Joy, which is being billed as one of the first modern adult fiction books for Orthodox Christian readers. Did you know that 25% of Ancient Faith Radio's annual operational costs must be covered by December giving? This means that we need to raise $50,000 before December 31. Please listen to this special message from Bobby Maddex, AFR's Operations Manager, to find out what you can do to help. Don't forget that AFR has collected episodes from our large family of podcasts to help make the Nativity season a truly joyful experience. Listen here to Molly Sabourin explain what it means to have "good will toward men" and then click on the image to the left to hear the rest of our Nativity episodes. 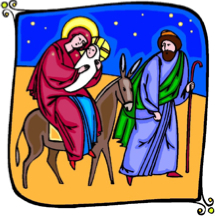 What is the significance of all those "begats" in the Gospel lesson just before Nativity? Fr. Thomas Hopko, host of "Speaking the Truth in Love" and "Worship in Spirit and Truth," breaks it down for us. On a new "Ancient Faith Presents," Bobby Maddex, operations manager of Ancient Faith Radio, interviews Elizabeth Crispina Johnson, author of the Conciliar Press children's books And Then Nicholas Sang and What Do You Hear, Angel? Both books were illustrated by Masha Lobastov.